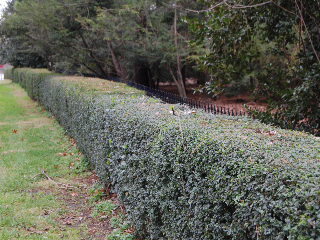 It’s hard to say “privet” without immediately following with the word “hedge.” The reason for this being that any time privet is planted, it is almost certainly put there to be shaped into a boundary hedge. A number of different varieties of privet exist within the Ligustrum genus, most of them being evergreen. Some, however, do exist that are deciduous or semi-evergreen in nature. Individual privet plants can grow to heights of 15 feet and sometimes greater, while reaching widths exceeding 8 or 10 feet. And the individual plants tend to be rather rangy and free flowing in their growth habit, making them not very attractive as stand-alone specimen plants. However, when the small plants are grouped together in hedgerow fashion (close together in linear alignment) and pruned on a regular basis, the result is a sculpted horticultural achievement that looks like one beautifully symmetrical shrub that helps to define the boundaries of your landscape while adding beauty to it. Privet is very undemanding of soil and sun conditions, growing satisfactorily in all but the poorest of soils if moisture is sufficient. Anything from partial shade to full sun will keep your privet plants thriving and growing steadily as they become bushier. Soon after planting, you’ll have to decide just how large you want your living hedgerow of privet plants to become, both in height and width. This is where the shaping, pruning, and shearing begins. The bad news is that it never ends! You’ll want to start pruning your privet hedge no later than the second year after it has been installed just to get a start on shaping and in order to encourage the plants to fill in to add more density to the overall hedge. When the hedge reaches the height and width you desire, the work doesn’t end. You’ll still need to shear the growth back 2 or 3 times each year in order to maintain the dimensions and so the hedge won’t look so wooly and unkempt. Privet is very tolerant of heavy pruning. If in a few years you decide the overall dimensions of your hedge are too big, you can cut it back drastically to the wood and new growth will still emerge and fill in to smooth out the surface. (Along those lines and on a personal note, we changed the height of the privet hedge in front of my childhood home from about 5 feet to about 3 ½ feet with no significant harm to the plants.) They’re tough! 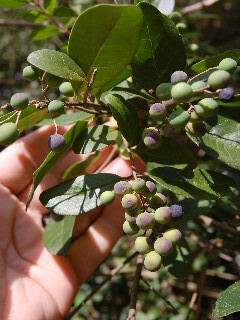 Privet will produce small white flowers in the spring that result in little (about the size of a pea) green fruit that turn purple in the late summer. This fruit is favored by wild birds and other creatures of the forest. However, these seeds are also easily dispersed by the birds and the result is unwanted privet plants that crop up here, there, and everywhere in unwanted places. Privet is an invasive species and hard to get rid of (because it is so undemanding of conditions! ), making it an undesirable species to some gardeners or plant purists in spite of its practicality in the landscape. Just as a side note for you Harry Potter fans—the wood of privet is white and many of the branches are very straight, which allows for scraping the bark and shaping into magic wands!